Will Volkswagen assemble cars in Vietnam? VietNamNet Bridge - The news that Phu Thai Holdings is speeding up negotiations to become the assembler and distributor of Volkswagen cars in Vietnam has been reported in many newspapers recently. In the context of Volkswagen’s escalating crisis, the managers of Phu Thai Holdings unexpectedly stated it would assemble Volkswagen cars in Vietnam. An analyst noted that Phu Thai Holdings is a powerful group that has invested in many business fields and has many years of experience in assembling and distributing vehicles for the US Caterpillar Group. They said the company was capable of assembling Volkswagen cars. However, the information still has raised doubts because of the timing of the release. Phu Thai is a large conglomerate, but its brand recognition among the public is faint. Its consumer goods, food and finance services are less known than other brands. Phu Thai has made great achievements in industrial equipment and vehicles, but many people do not know much about the field. 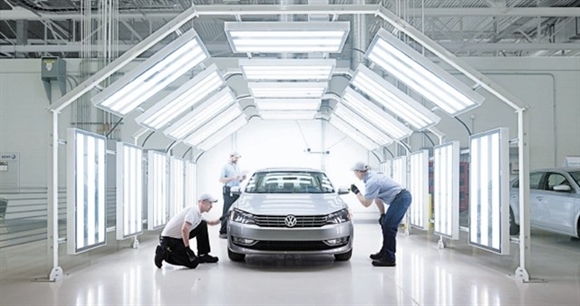 Duc Thanh, a branding expert, commented that if Phu Thai Holdings succeeds in bringing Volkswagen’s car assembling line to Vietnam, this would be good news for the domestic automobile industry. However, he questioned why Phu Thai Holdings decided to release the information at this moment. Volkswagen’s products have been available in Vietnam through World Auto, a Vietnamese distributor, since 2007. However, the German brand has not been famous in the domestic market, with only 100 products sold every year. If Phu Thai Holdings can reach an agreement with Volkswagen on assembling cars in Vietnam, it will automatically obtain the right to distribute the products. And if this happens, Phu Thai Holdings will become the only partner of the German manufacturer in Vietnam in 2016, and will only be able to begin assembling Volkswagen's cars in Vietnam from 2018. Meanwhile, 2018 will be the first year for Vietnam to apply the zero import tariff on the cars with ASEAN sources, in accordance with AFTA (ASEAN free trade agreement). The manager of an automobile joint venture noted that Phu Thai Holdings will have to face challenges when assembling Volkwagen because of the tax cuts and the weak domestic supporting industries. As such, Phu Thai appears to be ‘swimming against the current’: while automobile manufacturers are thinking of importing cars under the mode of CBU (complete built units) instead of making them domestically, Phu Thai is trying to assemble cars in Vietnam. Under the Trans Pacific Partnership (TPP) Agreement, of which Vietnam is a member, it will have to cut tariffs on the cars to be imported from TPP member countries as well. Meanwhile, Brazil and Mexico, both of which are TPP members, have large factories set up by Audi, Mercedes-Benz, Toyota and BMW.